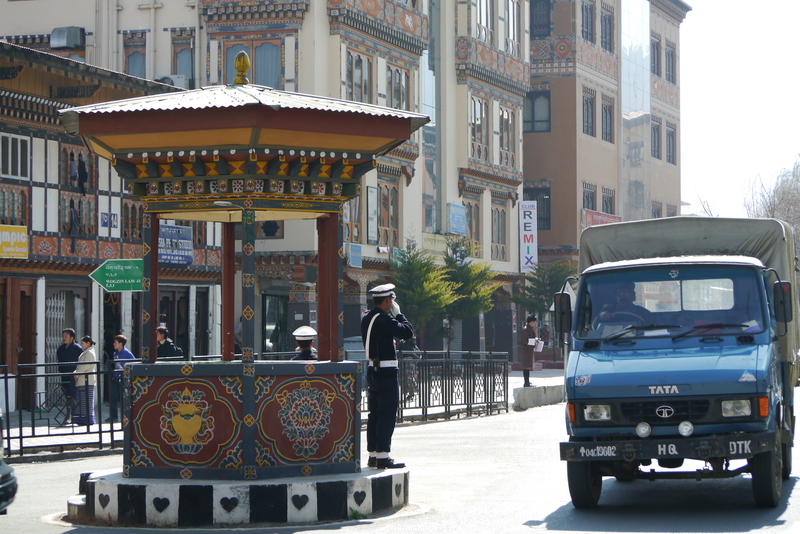 Thimpu is home to 10% of the population of Bhutan, about 80,000 people and 65% of the cars in the country. Residents complain that it is overcrowded and “ruined” but they don’t even have a traffic light unless you count the white-gloved police officer who stands at the busiest intersection directing traffic in town. 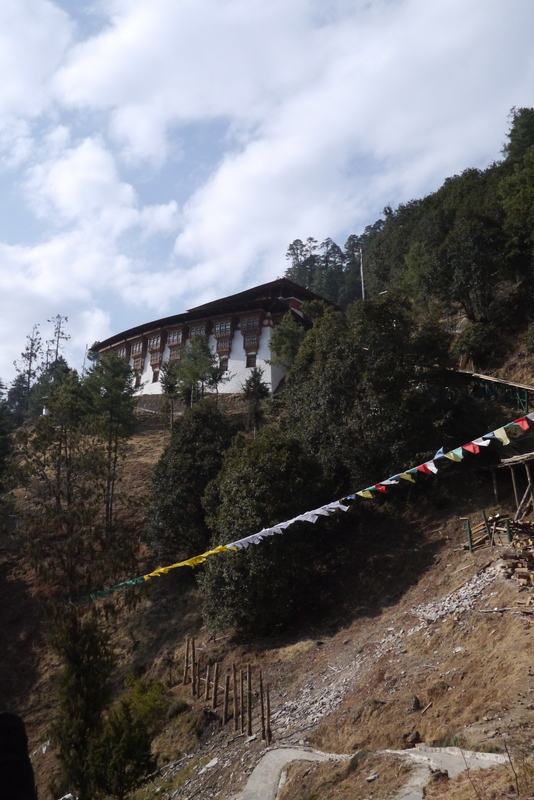 Ours was a modest guesthouse with a stunning view of the Tashichho Dzong built in 1772. What the guesthouse lacked in amenities, it made up in spades with this gorgeous view. Looking out at the Dzong which houses both the Sangha (central monastic body) and the central government administration, we found it impressive by day, but even more so as it is lit with white and red lights at night. Vegas would be all over this as the next casino design if they only knew. The Sangha makes up 1% of the population of Bhutan, about 8,000 monks. The monks reside for ½ of the year at Tashichho Dzong in Thimpu and the other ½ in more mild Punakha, further to the north. Influence of the Sangha is felt throughout the country, both in the presence of the monks in town, but also through more targeted programs like Values Education where monks go into secular schools and work with students and families to teach and ingrain Buddhist values. Dress and colors are very important in traditional Bhutanese culture. A monk’s level of experience can be determined by the colors on the shirt he wears, orange indicating ministry level, for example. Both the Sangha Raj and the King wear yellow. While street dress is about 50/50 western and traditional Gho and Kira, any time there is a public celebration or they enter an official location, Bhutanese must wear traditional dress in a very precise way. The women’s Kira is a rather constricting looking long skirt and silk jacket style top. Men wear the Gho which looks a bit like a big knee length bathrobe worn with long black socks and wingtips. The mix of east and west has modernized the shoe choice but resulted in a look that through Westerners’ eyes looks like men who forgot to put on trousers. Nonetheless, I think it’s a great look and brought two of them back for my husband hoping he might start a new trend. On our second day in Thimpu we drove about ½ an hour outside of the city through achingly beautiful countryside to a rural parking lot at the foot of a steep hill. A lovely stone path (built in two weeks as a surprise for the 7th Tri Rinpoche, a young incarnation of Tenzin Rabgye and current resident at Tango) lead us in gentle switchbacks up through the trees to Tango Thorim Shedra, the primary monastic college in the country. Tango, which means “Horsehead” is built on an auspicious spot, where Avalokiteshvara revealed himself as prophesized in Tibet and where Shabdrung Ngawang Namgyal meditated in a cave among other bits and pieces of stories I gleaned from Gembo. At our unhurried pace, the walk took about an hour, as our group bonded,deep in conversations. Arriving at Tango we were all struck by its beauty perched precariously on the side of a cliff. The hot milk tea and biscuits we were offered by a young monk were very welcome. We met with statuesque Lopen Karma, the VP of the school and had an opportunity to ask questions of him. Amazingly, we were permitted to witness a Mahakala ritual service while we were there. This was one of the most memorable moments of the whole trip for me. A few weeks before we left for Bhutan, a relatively new friend of mine, Sandra d’Auriol, had fallen to her death from the roof of a plastic surgery clinic in Beverly Hills. Making sense of her tragic death was impossible, but her memorial service in Hong Kong coincided with the precise moment we sat there in the temple at Tango, cross legged on carpets in mediation as we listened to twenty young monks rhythmically chant and beat drums with question mark shaped instruments and blow long haunting horns, the sound of which reverberated to the very core of my being. When we later stood, we were invited to a contiguous temple and told that the enormous Buddha (adorned with a gorgeous turquoise teardrop on the forehead that jewelry designer Sandra would have loved) was a special “wish fulfilling Buddha” as it contained many important relics. We were encouraged to make offerings and mine was the most earnest wish for Sandra’s family, her husband and two beautiful daughters to find peace and happiness in life and relief from their suffering. I had a really clear understanding this this was precisely what I was supposed to be doing then, and perhaps the reason for my trip. We loved Tango so much we lost track of time. The cold set in and so did the darkness. We descended along the stone path in the dark, thankful for the torches and iphone flashlight apps we had along. Dinner that night at the Folk Museum of Bhutan was delicious. We sampled native cuisine from all regions of Bhutan including the local rice wine called ara, salty butter tea, momo and many other local dishes. This was a fantastic meal, but an even more unbelievable day. Dasho Karma Ura, who, working alongside the King, gave shape to Gross National Happiness, Director of the Center for Bhutan Studies and modern-day Renaissance man invited us to his home for lunch the following day. In his living room we sat comfortably as the wood stove crackled and his youngest daughter chased her new kitten around while Karma Ura enlightened us on everything from his theory on Japanese malaise to geopolitics, formation, government processes, heat generation, GNH and so much more. We sipped our sweet tea, ate fermented millet to warm our stomachs and listened intently. Karma Ura’s talents are nearly boundless. When he believed a festival was lacking, he created a new one including choreography, costumes, story and all. The new temple on Dochela pass includes detailed contemporary wall murals he painted. He recently published a chapter in a thought-provoking book called Learning From The World. I took so many notes and have many thoughts on GNH, so will save those for a separate post, but suffice it to say, meeting Karma Ura and hisfamily was extraordinary. We left Karma Ura’s and went straight to Semtoka Dzong, a temple and monastic school for younger monks built in 1629 in Thimpu. We met the vice principal and our group got a little bold asking about the benefits of celibacy as the essence of Vinaya. Gembo must have had a time of it translating in that meeting, but handled it with his usual aplomb. While the Dzong was beautiful, the most memorable element of our time there was an impromptu history lesson on all of the reincarnations of Avalakateshvara and philosophical teaching on the union of bliss & emptiness Gembo gave on the spot in the new museum annex. Dinner that night was at a restaurant called Jampelyang Resort on the opposite bank of the river with a beautiful view of the lights of the city. Our hosts for the evening, Cheki and her husband Kinley, were fantastic. Cheki is one of 9 children, including our friend Nomgeil who helped cart us around all week and Lam Jampal, District Abbot, and now dear friend too. Each of these four amazing people has a story I would love to share separately. Cheki’s 15 kilometer walk each day to go to school when she was young, Nomgeil’s terrible experience pumping gas and working in a Japanese restaurant kitchen in midtown NY on a fated flirtation with the American dream, and Lam Jampal’s recent work to build a secular school to support his monastery in the East. I love this family and would like to send business to Cheki’s travel agency, find Nomgeil a wonderful wife and raise funds for Lam’s school. 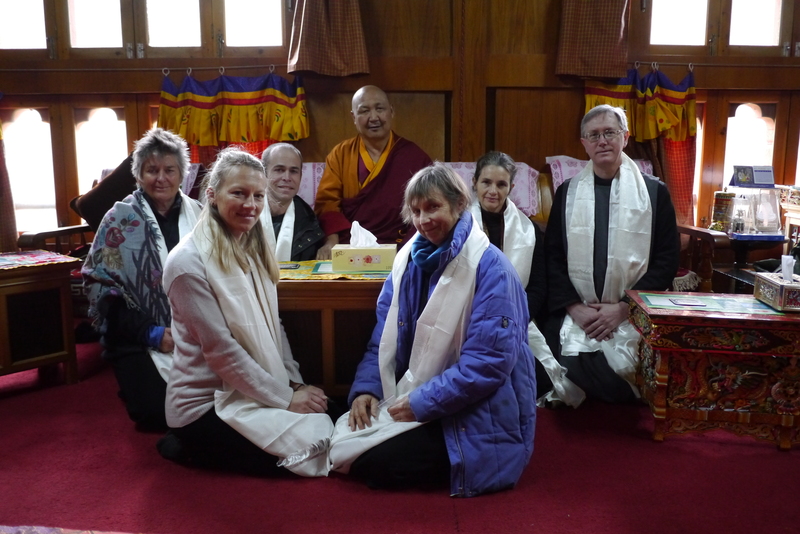 On our final morning in Thimpu, in a light chilly rain we walked across the main courtyard of Tashichho Dzong to the private chamber where his Eminence Dorji Lopen Rinpoche, the Vice Sangha Raja awaited our visit. This beautifully imposing man sat cross-legged on a platform, cloaked in robes, commanding the room without saying a word. We presented our white scarves and bowed our heads low and he placed them around our necks and gently touched our cheeks. We spent two hours in his presence asking questions about the path to mahamudra, shamata, Vipassana and so many other topics, and he replied with patience and wisdom, offering just the right teachings and examples for our group. Before we left, he offered us a blessing to “tie our karma so we continue to be together.” The energy was truly electric as we all sat with our heads bowed and he chanted then presented us with silk cords and mental health herb pills that had been blessed and consecrated in a way to help generate awareness and benefit those with mental problems. I am definitely going to hold onto those! The photo of all of us taken afterwards looks like we all just went through the ringer. I can’t describe exactly what it feels like to have your karma tied to a monk like that, but I can say that we all felt changed by it. We left Thimpu in a warm daze and headed up and over the pass to Punakha.